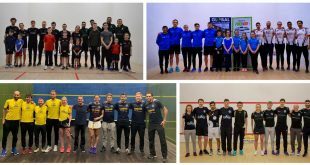 It took ten rounds of league play to decide the semi-finalists for the 2012 Premier Squash League, but today’s two semi-finals were decided in little over an hour’s play each ! 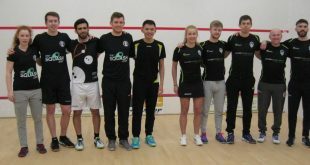 Duffield, dominant in Group A, suffered a second successive home semi-final defeat, but whereas last year it went to the wire against eventual champions Surrey, group B runners-up St Georges arrived tonight with a full strength squad and wrapped up the match 3-0 in double quick time. 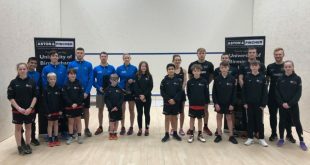 Joe Lee put the visitors ahead against Paul Hargrave, while in the women’s match Laura Massaro took twice as long to beat Jenny Duncalf, and shortly after she had come off court with a 3-1 win, Nicolas Mueller wrapped the match up with a “fast and furious” 3-0 win against Duffield’s Andy Whipp. “It was a great night for us,” admitted St George’s Hill team manager Danny Lee. “All credit to Laura for giving us a great start in a good tactical game against her England team-mate. There’s been a great team spirit all season and they were all up for it tonight. “I’m also really pleased for our sponsors TWP who have supported us now for the past four years,” added Lee. The other semi-final was even quicker as defending champions and group B winners Surrey H&R went 2-0 up against a weakened Nottingham team courtesy of 3-0 wins from Alison Waters and Adrian Waller, and well before the 9pm watershed they were 4-0 up as Alan Clyne and then Adrian Grant followed suit. “It’s very good to be in the final again,” said Surrey Health team manager Pete Smith. “All our team performed well tonight and we now look forward to meeting St George’s Hill again. 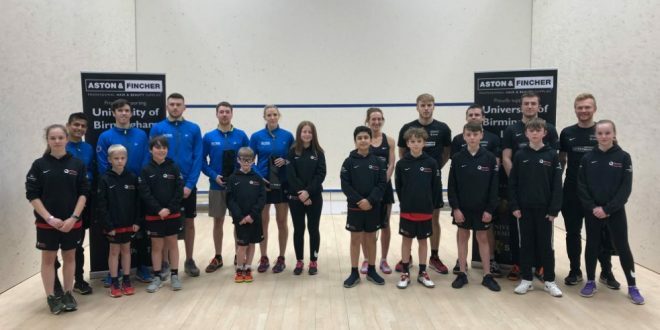 Peter Barker made it a clean sweep of 3-0 wins for Surrey, while at Duffield Steve Coppinger pulled one back for Duffield and Nick Matthew and Daryl Selby kept the crowd entertained well after the finish of the regular match as Matthew made it 2-3 on the night. The final is scheduled for Tue 8th May – probably at Surrey Sports Park, as last year. I feel the end result of this semi will depend on the result of the women’s match – World No 2 versus World No 3 should be a cracker! I think the men’s matches will be 2 games each.